In case of atmospheric overvoltages, the lightning-resistant SDS ... voltage limiting device is capable of returning to its initial state after discharging the impulse current. Only if the specified lightning current load is exceeded, a permanent short-circuit is initiated by heavy-current-resistant welding of the electrodes and the fuse link has to be replaced. The SDS voltage limiting device consists of a spark gap unit and the respective connecting kit for direct connection to the rail or overhead contact line tower. The spark gap unit of type SDS 1 (Part No. 923 110) developed by DEHN + S�HNE has also been approved by the German Federal Railway Authority (EBA). DIN EN 50122-1 describes the use of voltage limiting devices for d.c. and a.c. traction systems for so-called "open traction system earthing" of conductive components of overhead contact lines and current collectors. 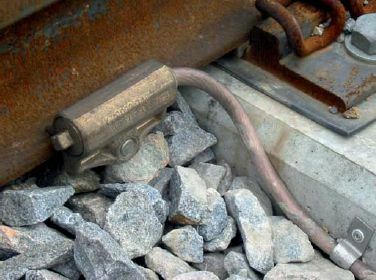 In order to prevent the occurrence of hazardous surges between the insulated tracks or track sections of electric railways and earthed parts of the installation, voltage limiting devices (SDS ...) are used. Their function is to permanently connect parts of the installation in the overhead contact line and current collector areas to the return conductor as soon as the threshold voltage is exceeded.